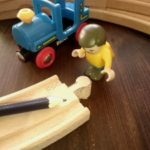 David Harper’s wooden railway is a epic work of love created over many, many, years and has now got so big it’s outgrown his house! I love my trains and railways, I’ve got every type of toy and miniature model, from Brio to Lego to Hornby but none compete with this and I can only dream of one day having something this great. 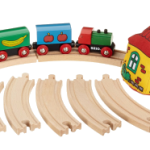 With over 100 pieces of rolling stock and countless accessory pieces spread over 490 feet of track it’s Brio bliss for any small child. Photos and more information on this amazing wooden train layout can be found at www.woodenrailway.org, click here. The Denistone River river section with the Golden Gate arches and lifting bridges, port, and ferry. 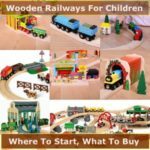 Click on the the pictures for a bigger view, alternatively, if you’re looking for help and ideas for your child’s railway, see wooden trains for children. 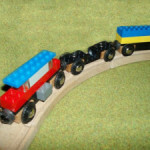 How many pieces does your child’s railway have? Does it have a river? 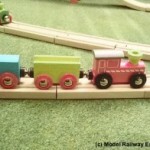 Jump in, share the info on your wooden railway in a comment below and let’s compare.